When a frightening experience turns fifteen year-old Robie’s unsupervised Hawaii vacation into a nightmare, she boards a plane for home on the Midway Atoll, a group of Pacific islands. In the chaos before the flight, Robie’s name wasn’t entered in the manifest. So when the plane goes down over the vast Pacific Ocean, no one knows to look for her. Stranded on a tiny raft with Max, an unconscious pilot, Robie’s chances of survival are slim. They have no water and only a small bag of skittles to eat as they drift on the open sea waiting for rescue. An uninhabited island might allow refuge from the sharks, but with little understanding of wilderness survival, Robie has little hope of living there long. It will take all her wits and courage to find rescue. As I started reading this book, I worried about two things happening: one, Robie and the pilot, a young man in his mid-twenties forming a romantic relationship, or two, the pilot basically taking charge and making all the decisions and telling Robie what to do so that she becomes more of a passive character in her own story. Thankfully, neither of these things happened. Max’s injuries make him unable to help her very much throughout the story. Though his character serves an important role, he doesn’t dominate the tale, and Robie is clearly the hero. The writing was solid but a little bit flat, for me. I had a hard time pinpointing what wasn’t working, but I think it was that some of the intense scenes, like the crash, were so brief that I didn’t really have time to emerge myself in them and react. The narrative worked because Robie was in shock, but I think I would have gotten into the story more with more detail in those moments. Over all it was good. I’d recommend for maybe fifth through seventh graders. No profanity. A few instances of brief crude language. A man on the street grabs Robie, but she escapes. A violent storm causes her plane to crash. 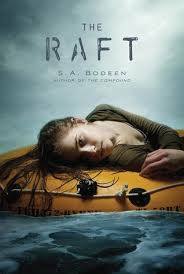 She and an injured man survive on a life raft. The crash doesn’t have a whole lot of scary details. It’s straightforward but pretty brief. References to a drunk driving accident that killed a teenage girl. Tagged Feiwel & Friends, Pacific Ocean, plane crash, S A Bodeen, The Raft, wilderness survival. Bookmark the permalink.